Bob Stutman (left) and Steve Hager (right) debate marijuana Tuesday night in Festival Concert Hall. Steve Hager and Bob Stutman filled Festival Concert Hall with around 150 people Tuesday night. The duo has been travelling around the country, campus to campus, talking about marijuana. Steve Hager, former editor-in-chief of “High Times Magazine,” is one of the leaders of the pro-legalization front. His fellow debater, retired DEA Agent Bob Stutman, is one of the most outspoken opposer on the issue. Hager cited the many uses of hemp products and the renewable nature of the source as a reasons for legalization. He also mentioned that the first American Flag was made out of hemp. 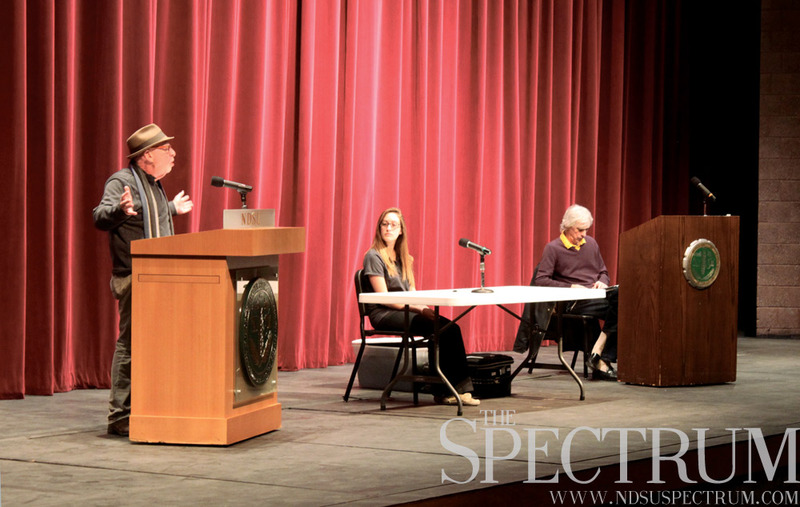 Hager, a Woodstock alumnus, also mentioned that consuming marijuana is a part of the counter-culture with which he identifies. “We are good people… its a part of our religion,” he said. “Most people want it (marijuana) legal because it is their intoxicant of choice,” Stutman said. He also went on to say that the level of younger users, ages 12 to 18, in Colorado have increased. Hager cited that many laws in America are continually filling prisons. Stutman and Hager both agreed drug use should be considered a public health issue. They also agreed the prison population is too large. “A stupid policy is throwing people in jail for using drugs… it needs to be treated as a public health problem,” Stutman said. They also agreed that children should not consume cannabis. This event was brought to NDSU by Campus Attractions Issues & Ideas committee.